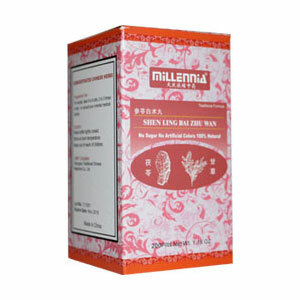 Shen Ling Bai Zhu Tablets help maintain the health and well being of the spleen, the stomach and the digestive system. Deficiency of the spleen and stomach marked by anorexia, loose stools, or diarrhea, or vomiting, weakness of limbs, emaciation, chest distress, epigastric flatulence, sallow complexion, pale reddish tongue with white fur, and thin and slow pulse or feeble and slow pulse. For Adults, take 5 to 8 pills, 2 to 3 times a day; or consult your TCM practitioner. Do not use if you are pregnant or nursing, if spitting up blood, or in cases of diabetes, hypertension, liver disorders, severe kidney insufficiency, hypokalemia, intermittent fevers or chills, cold disorders, abdominal distention, constipation, or tuberculosis. Take with caution in cases of peptic ulcers. Do not use for prolonged periods of tiem or exceed the amounts suggested for use, except under the supervision of a qualified health practitioner.